These blankies are sooooo soft and warm. 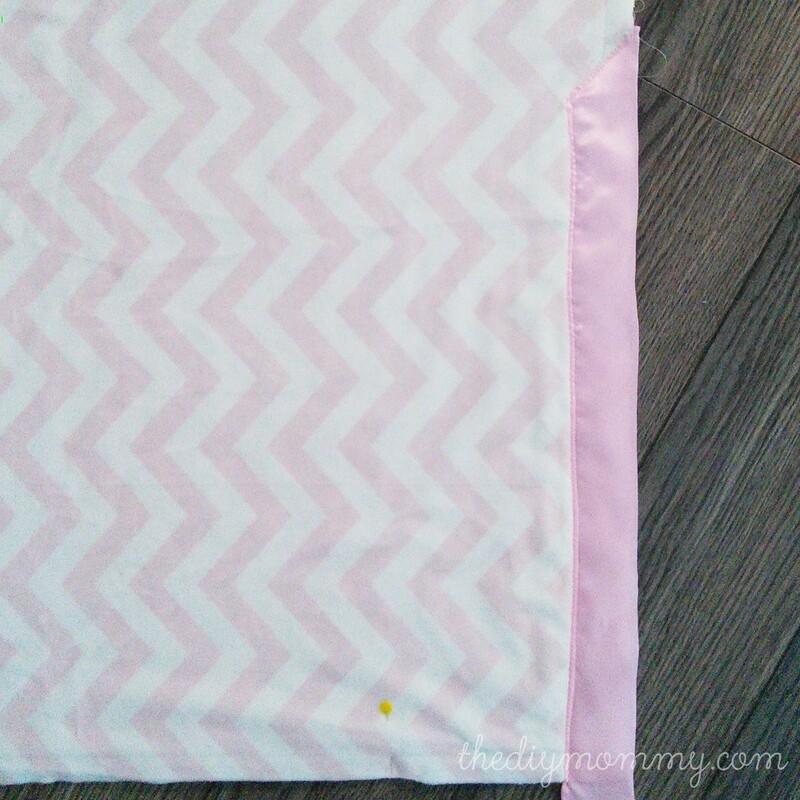 They have two layers of minky cuddle fabric sewn together and bound by a satin edge. 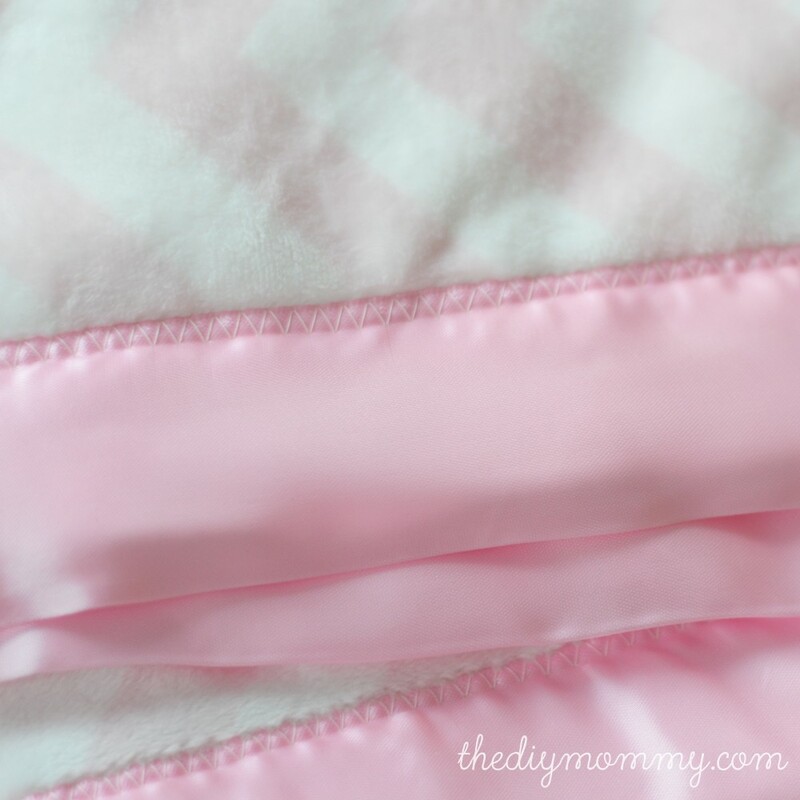 I daresay this is the most perfectly decadent DIY baby blanket combination ever! 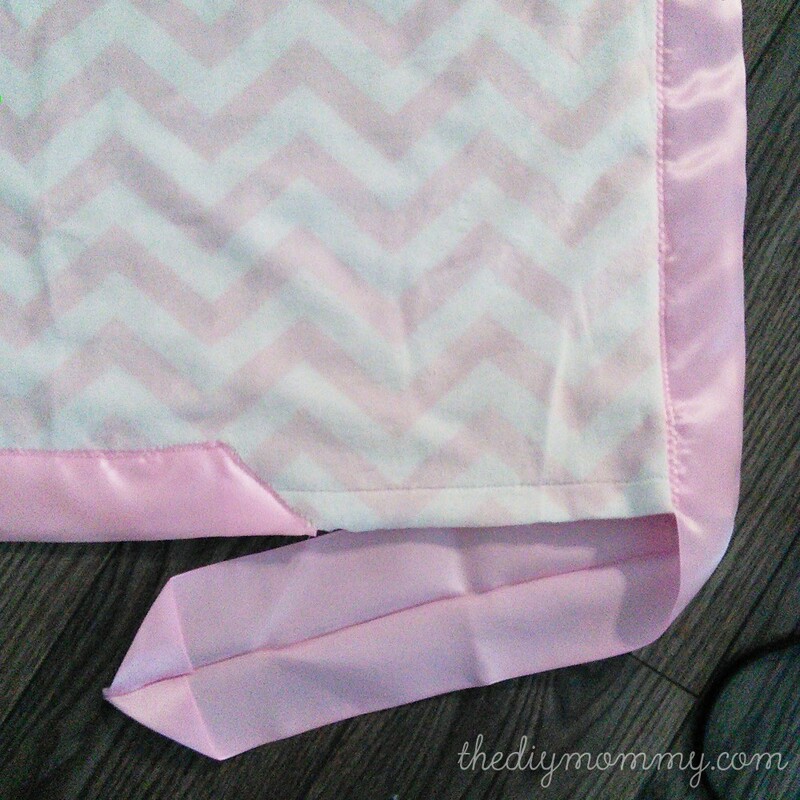 I remember trying to sew satin binding on a baby blanket a long time ago and thinking it was WAY TOO HARD. Well, I took a stab at it again and it wasn’t so bad! 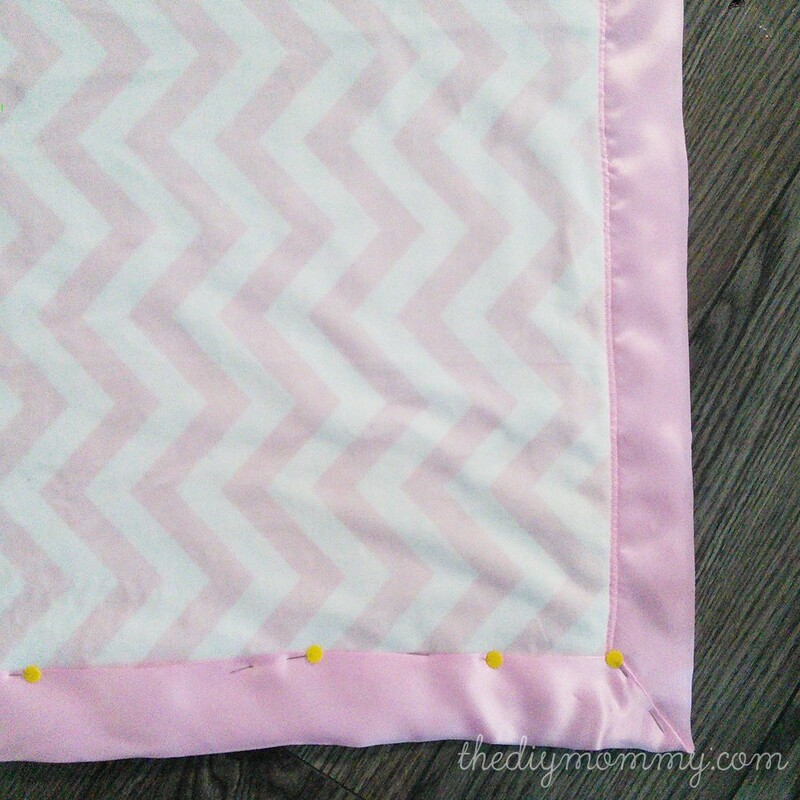 All it takes is patience and PINS – the Two Essential P’s of sewing satin blanket binding. 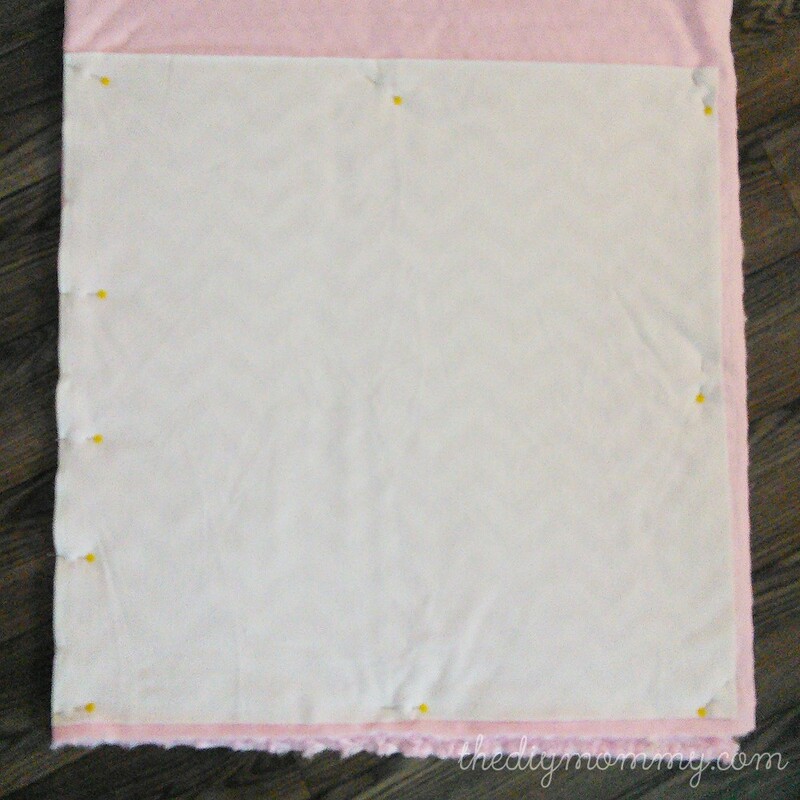 Cut out a perfect 30″ x 30″ square from the patterned minky fabric. I use a straight edged ruler, cutting mat and rotary cutter make sure I’m cutting a nice, straight square. Repeat for the second blankie if you’re making one. 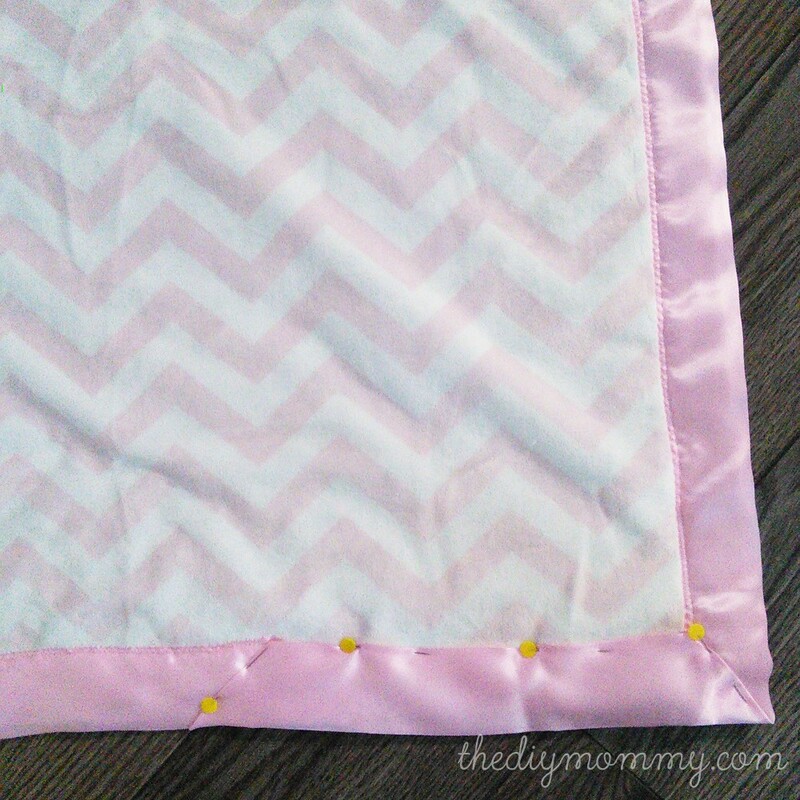 Lay the square over top of the rosette minky fabric and pin them together. 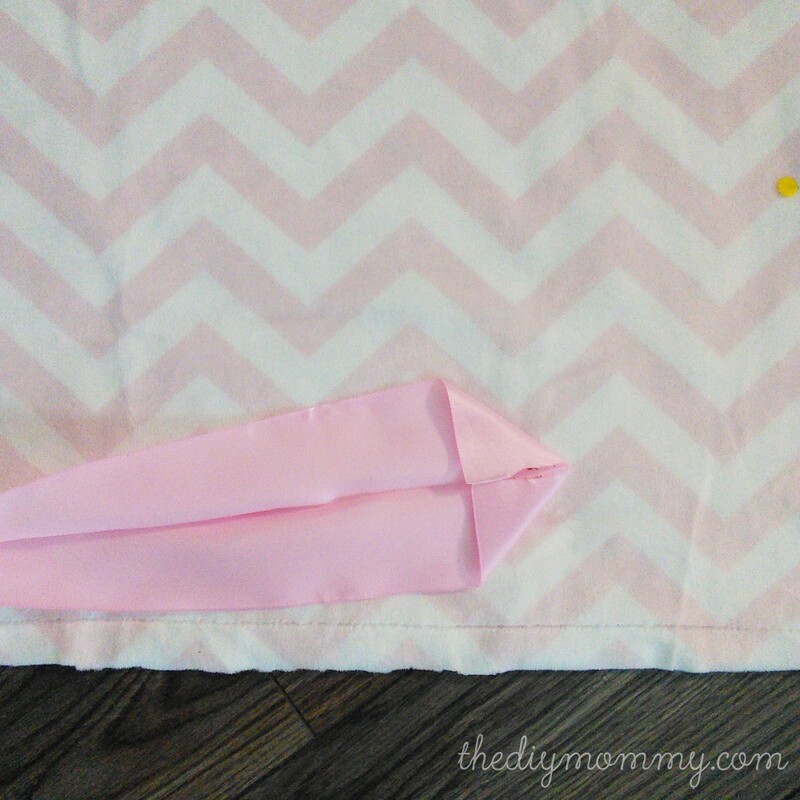 Use the first square as a pattern to cut a square out of the minky rosette. Repeat for the second blankie. 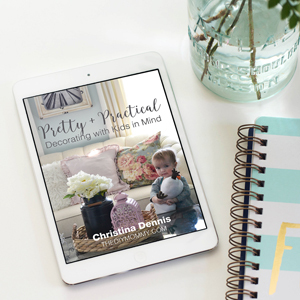 Place a square of patterned minky fabric and a square of rosette minky fabric wrong sides together and pin well around the edges. (That’s my secret trick when working with slippery, slidey minky – pin, pin, PIN!) 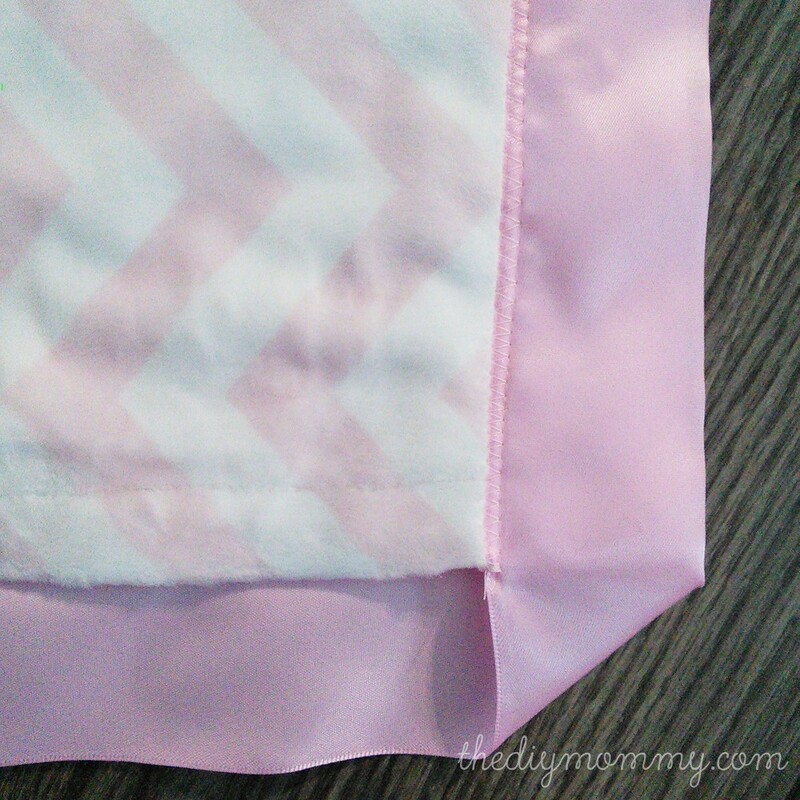 Sew the layers together by stitching a seam about 1/2″ from the edge. Use a long stitch length to help the minky slide through the presserfoot. You can also use a walking foot on this type of fabric if you like. Open up the satin binding, fold the ends in as pictured above, and iron them gently. Fold the binding over the edge of one side of the blanket, starting near the middle. Pin it like crazy along the edges of the binding. I found pinning parallel to the satin binding edge worked the best. Don’t be shy with your pins, folks! The more, the better. As you’re pinning, make sure that you can feel that the bottom and top edges of the binding are in the same spot. You can adjust the miter so that the crease is in the same spot on the top and bottom as you are pinning it. 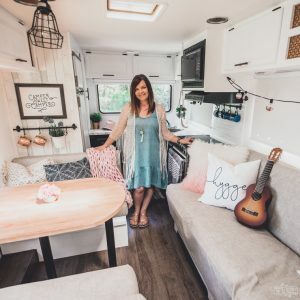 Don’t forget to iron it lightly – it really helps! 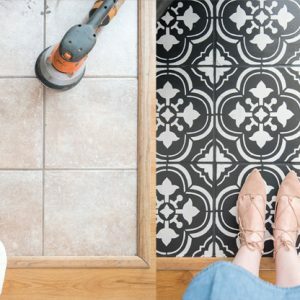 Repeat the zigzagging and the corner mitering until you reach the side you started on. Then, open up your binding, cut it so that it overlaps about 4″ over where you started. Fold the ends under as shown above and press them. Pin everything again, and continue zigzagging over the edge, and down the diagonal end. Voila! 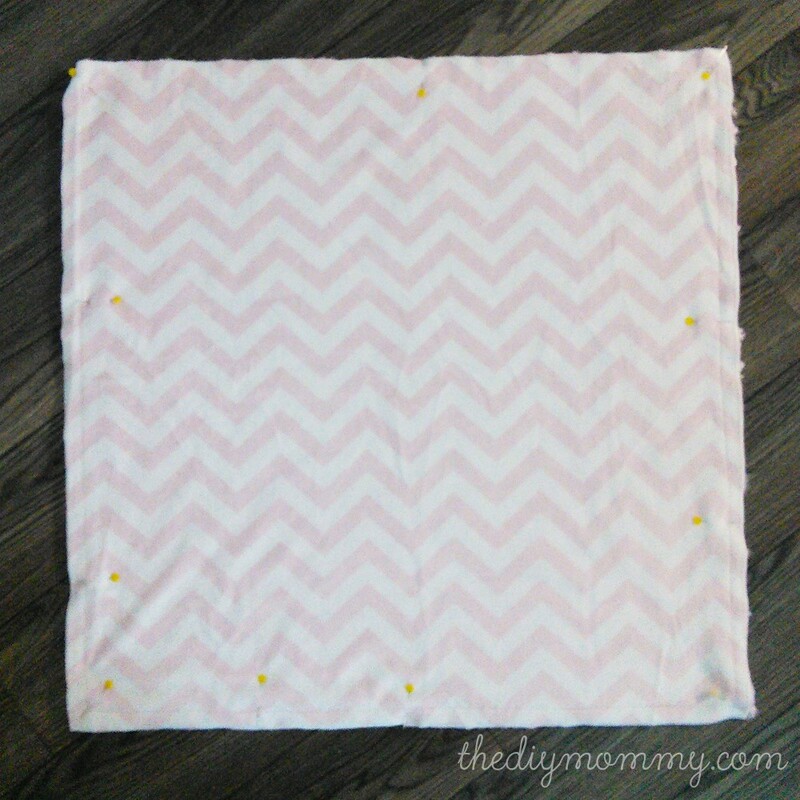 A soft, supple, and perfect little handmade baby blanket fit for any new baby to love. 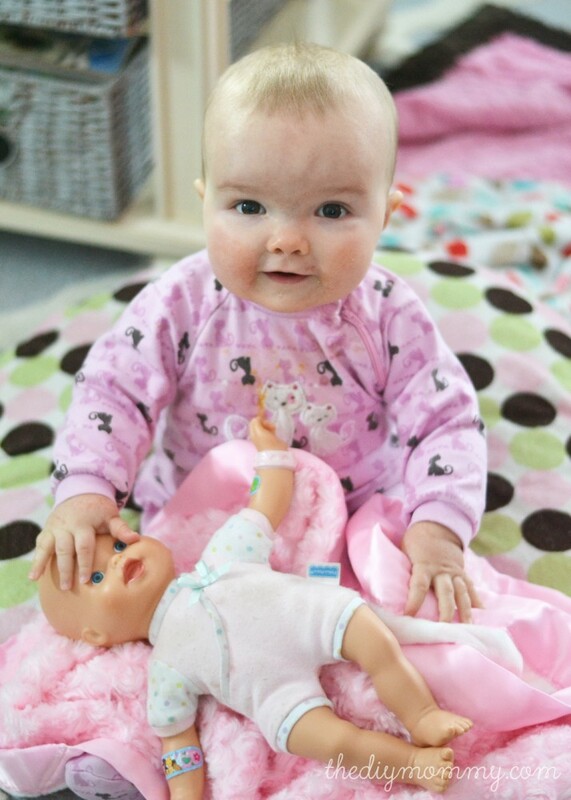 Baby B loves hers – applesauce mouth, baby food jammies and all! This is SO sweet Christina!!! Looks like a beautiful version of my son’s favorite “Green Blankie.” I really need to learn how to sew! Do the 2 layers stay together when you wash the blanket? I was thinking about using your method for a super soft rosette minky/flannel blanket. The blanket is quite small, so I haven’t had any issues with the layers shifting or bunching. I’ve washed the blankets dozens of times already and they’re still looking good! 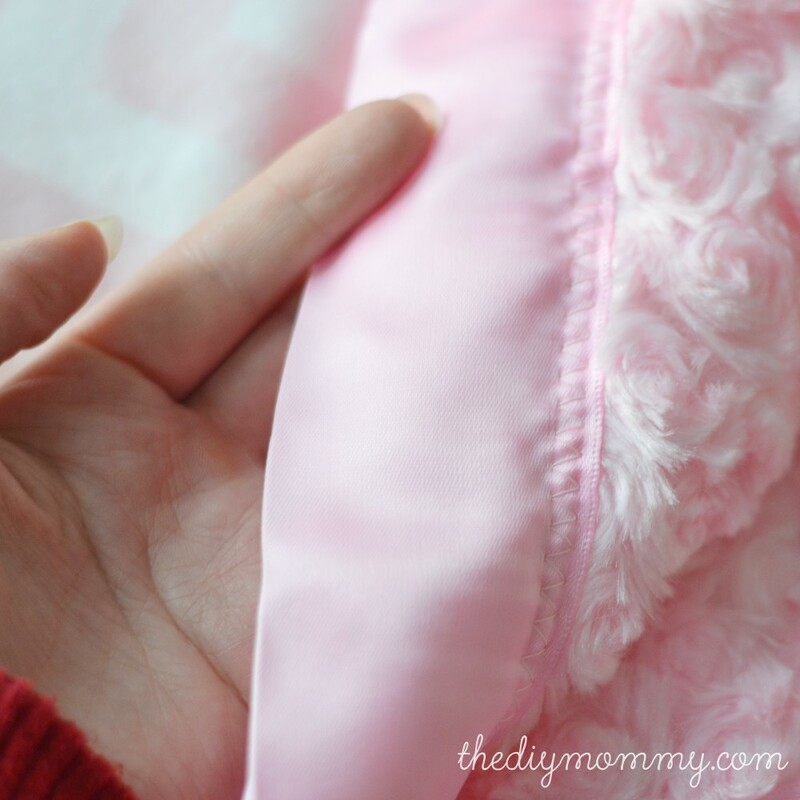 Doesn’t the minky really stretch and pull as you sew it? I usually have to see from the middle out to the end and then start in the middle again on a regular self binding minky. So I’m curious how this would work. Sorry, I don’t have any for sale. June: There are lots of minky baby blankets for sale on etsy. So cute! This is just the tutorial I’ve been looking for! I’m still very much a novice in the sewing game, but my mama (whom I finally let teach me how, lol) says I seem to have an intuitive knack for it. So my third kiddo (8 mos) has recently shown a very clear preference for her fluffy minky blankets, but I don’t want her lovey to be a full-size one, you know? 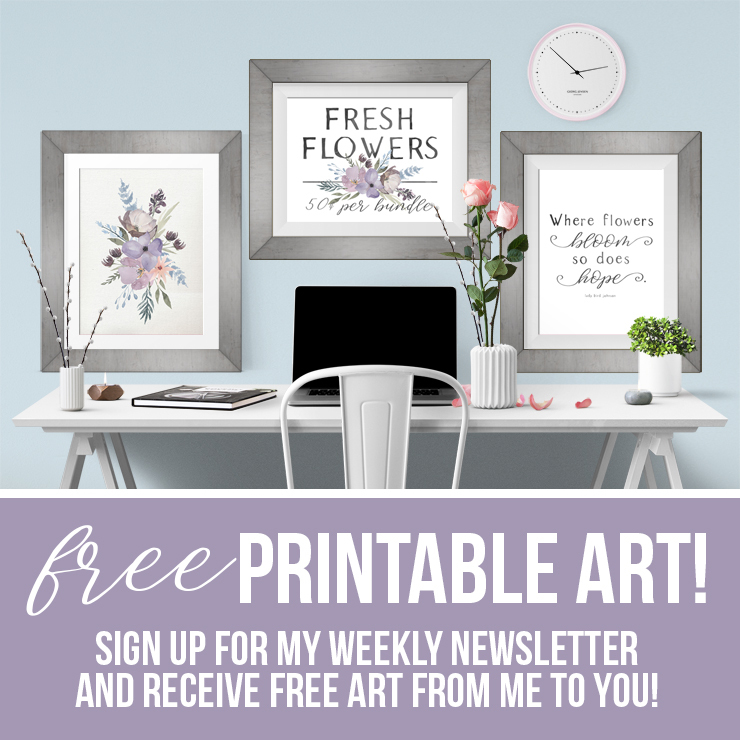 Naturally, I decided to make her a couple, maybe 12-15″ square and was feeling lost on where to begin! I do think I’m going to go splurge on pre-cut/packaged satin binding, rather than the strips of satin that I purchased… make things easier all around, I’m sure. Thanks for your tips! What a great idea I am sure she will absolutely love that and will be so easy to take along with you! Thanks for giving such wonderful idea of sewing our own blanket with the best fabric we feel would be suitable for the newborn. 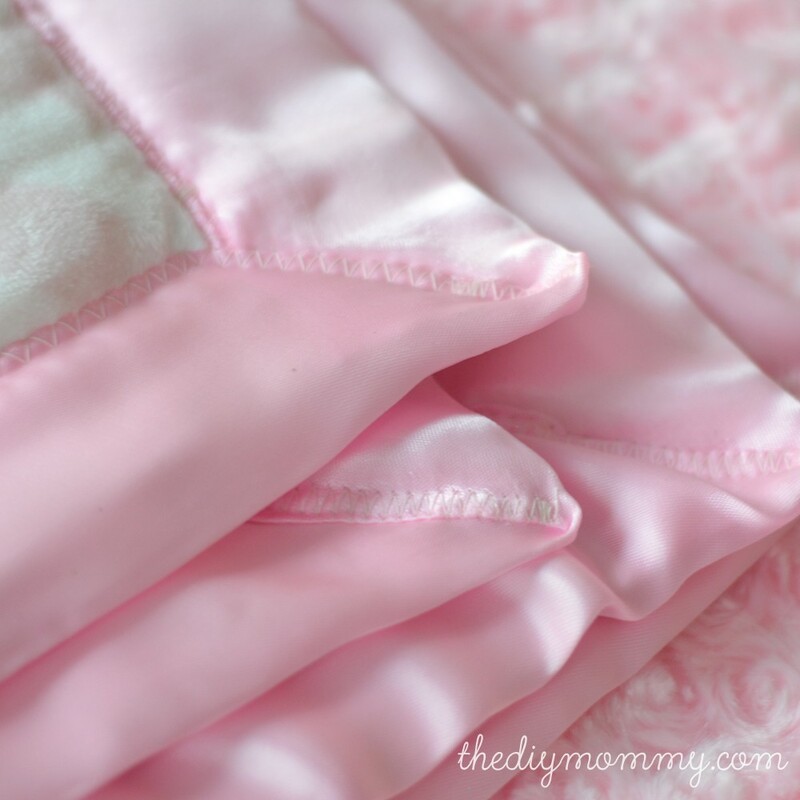 This post is very helpful for the parents who always wish to choose the best fabric for their baby.Babies always cuddle while sleeping so it is really very important to take care that the blanket is extra soft and doesn’t harm the baby’s skin. So happy you enjoyed the post Bessie! 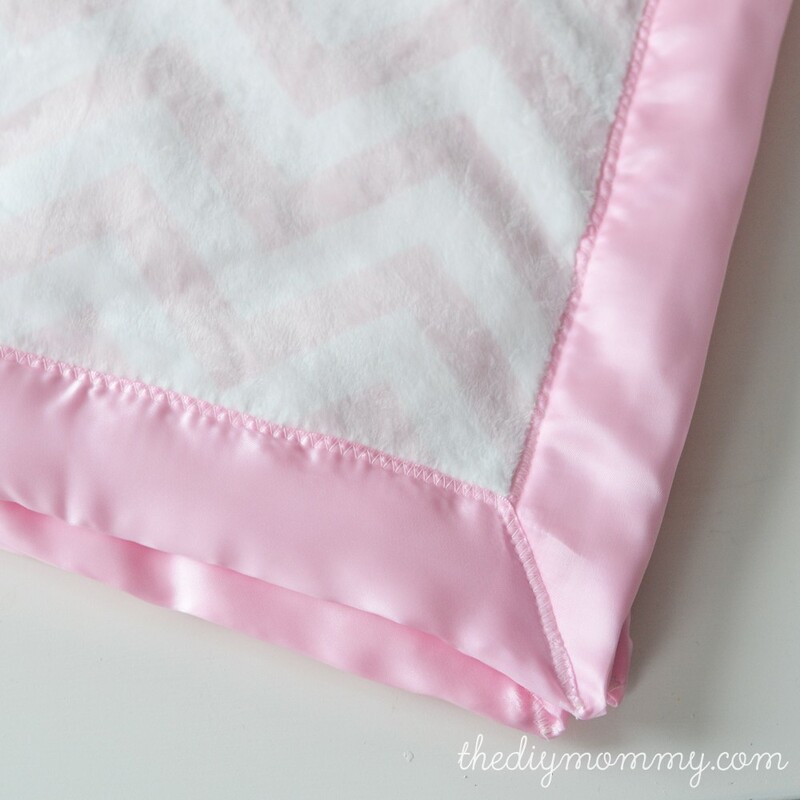 Just wondering when you sewed the blanket inside out, you then turn right side out, is the satin easier to sew when you’ve pre sewn, I’m making a crib size boys blanket with satin finish. Just to let you know I see what you did in sewing wrong sides together. I was also following another pattern along with yours. Your way is a lot easier, I will do that next time. great tutorial. 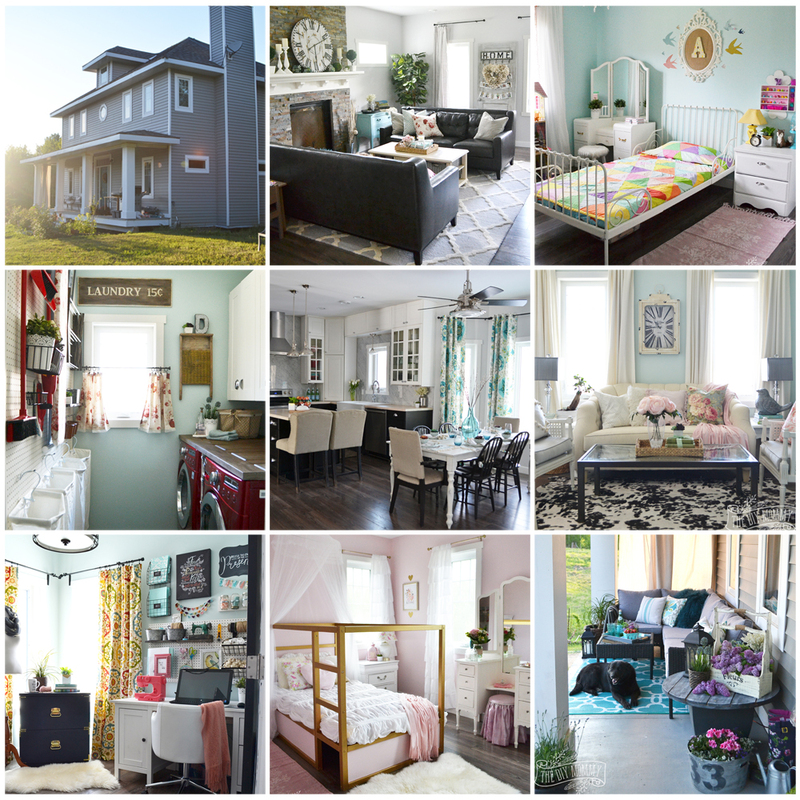 I am sure the fabric exchange has so many choices of fabric for this kind of project. Do you remember how much you spent on the fabric and blanket binding?? It has been great to read such blog. I really appreciate it.This blanket works great in cloths, and cotton. (I used a Cuddle/mine fabric for the center panel to make it extra snuggly, but I wouldn’t support mine for both front and back because the mine is a little trickier to work with.) I would also suggest pre-washing all material (and ironing) before making this blanket. I sewed a piece of minke to a piece of flannelette, then used a good quality satin binding. My machine seemed to be pushing the top of the binding while the bottom was grabbing it up more quickly causing a pucker-like appearance on the bottom and en excess of binding on the top. Any tips to feed both evenly so there is no puckering or excess? My machine does not allow for adjustments in the presser foot. So helpful. Exactly what I needed. Thanks! That is so wonderful, Josh.